As you know, I'm a big fan of cloth diapering. The twins have been in cloth diapers for over a year now, and I really love it. My husband, who does the laundry, doesn't like it as much. lol I like it because they don't leak as much as disposables, my kids don't get diaper rash as often, and it's just better for the environment. CC Bums has affordable cloth diapers in all different styles: all-in-ones, all-in-twos, pockets, fitteds, and covers along with baby wipes and mama cloth. Her diaper and diaper cover prices include shipping and any applicable inserts, so there are no hidden or surprise charges. The best part is that they're less expensive than most "brand name" diapers - except that some are not one-size, so you would need to buy different sizes as your child grows for those. 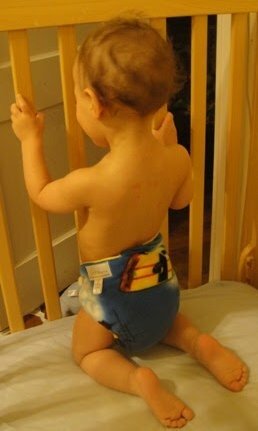 CC Bums sent us an adorable pocket diaper with a racecar on it (see pictures of my little cutie above and below). The pocket diapers have a fleece outer and cotton inner, and it came with a cotton tri-fold insert. I love how adjustable the diaper is, so the large size really can fit a baby/toddler from 22 to 35 lbs. 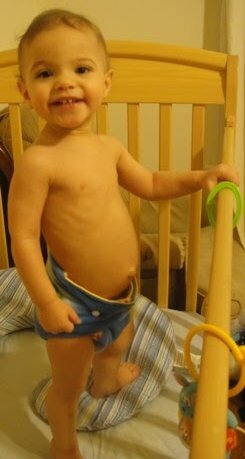 (Dovid is not quite 22 lbs yet, but the diaper still fit really well.) It also has snaps, which I much prefer over velcro. After having most of the velcro on my stash of bumGenius pocket diapers completely die, I will never again buy a cloth diaper with velcro. Sure, it's adjustable, but I prefer knowing that the diaper won't just fall off and that my kid can't just pull off the diaper even while fully clothed. The insert for the pocket diaper folds over three times in order to provide ample absorption, but it's not bulky the way other pocket diapers can be. The insert also fits perfectly into the diaper with minimal bunching. CC Bums has so many different designs and will even make custom designs from fabric that they have. The fabric is also soft and will not irritate my children's sensitive skin. Because the fabric is warm, hopefully it will keep them nice and toasty during the cold winter months. I would be nervous, however, about putting them in these during the summer when the fleece might get too hot. Overall: We give CC Bums a 9/10! Your baby is so adorable in this diaper. Thanks for the review. I, too, love cloth diapering!